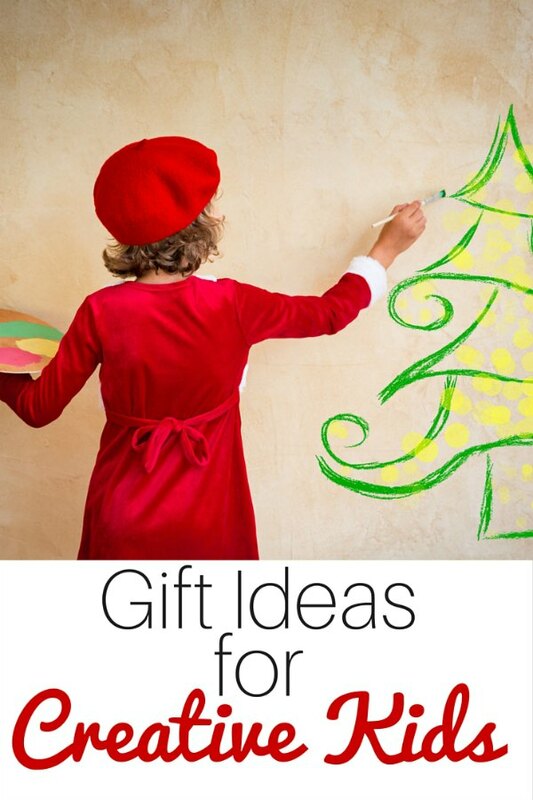 Do you have creative kids on your gift list? Have little ones who always want to do crafts? These ideas are sure to delight your artists, bakers and crafters in your home — take a look and find the gift that’s perfect under your tree! Personalized gifts make my day — I know I’d enjoy seeing my kids’ creations on my fridge with these magnets. You’ve heard of color by number? This fabric by number pillow looks like fun for tween girls! We received this kit the other day, and can’t wait to jump in. Smaller children can color the Shrinky Dinks, but the jewelry making looks a little more complicated. I’m already longing for spring, so this wind chime kit caught my eye. ALEX Toys Craft Knot A Quilt Kit Want to start with fabric crafts, but don’t know how to sew? You can make this quilt simply with knots. No cutting or sewing required! We’ve given these as gifts to nieces before, and they’re a big hit! Every little girl needs a place to store her treasures — these mosaic jewelry boxes are wonderful! Making decorations with chocolate? This pen makes it easy to craft the perfect fun desserts! Easy preschool and toddler arts and crafts in one box – gifts like these make my life easier. I LOVED my Spirograph when I was a kid! I think it’s time to pick one up for our family! We own many Melissa and Doug stamp sets, including this one. They’re a family favorite. My boys are asking for these in their stockings this year! There’s also a frog! This kit would be perfect for family movie nights, sleepovers, or birthday parties! This is a wonderful gift for any child who wants to create art – I purchased a kit like this years ago for my oldest daughter. With an extra large loom, you can make crafts or tapestries with this kit! On the extremely rare occasions that I allow glitter in my house, these are the pens we use. All the craft supplies you’d ever need, all in a big jar! I love it! My kids love crafts from air dry clay – this cupcake set is going under my tree for sure! Have some dog lovers in your crafty kid bunch? How cute are these? It’s been many years since I did any needlepointing — this kit looks like something I’d enjoy for myself! Did you know there were so many things you could do with Duck Tape? Raise your hand if you remember these projects from when we were kids! My kids know I love handmade ornaments from them as gifts. I know we’ll be making these one day soon! You can’t deny the extreme cuteness of this craft! Sure to delight any artist, this kit is a wonderful gift for Christmas or birthdays. My preschooler spied these and said, “Are those for me?” Super cute idea! Have a budding artist at home? I love the idea of pencil by number paintings! Perfect for a mother/daughter crafting day, or fun for a sleepover! We’ve always been pleased with the quality of these kits. I’ve got these sticky mosaics on the list for my preschooler – they’re a fun art project, as well as a way to sneak in fine motor skills. Want your child to learn to crochet? This kit is perfect! I love these yarn trees to hold jewelry or hair accessories, or even for making tiny holiday trees to decorate kids’ rooms. These little felt boxes are perfect for storing tiny treasures! What’s your favorite creative gift idea? I’d love to hear your ideas in the comments!